Architecture is always been a most special service due to its specialties and great cost. The architects can only get a few projects for a month, but they can earn thousands or millions of dollars. Each chance comes in this industry is really important, that’s why each communication channel useful for marketing helps the architects to catch the users attention. Notably, the website is a most liked marketing tool by the architect’s works around the world. Because the clients want a sharp and valuable outline of the design with creative reflection to get a good and cost worthy end result. For visualizing and spreading the plans and services in trustworthy look all around the world, the website will be the finest tool forever. If you can create a design as per customer wish, the website will surely bring thousands of clients for you from online. Especially, the WordPress themes will be the best and cost less tool for creating your website. So that, we have brought a short list of incredible WordPress architecture themes uniquely designed for the architecture businesses. Each theme created with the fantastic font and color combinations. As well they come with outstanding page templates and functionalities. Are you trying to discover a proper theme for your website? Just make a look down and select a best one suits for you. Tilemax is a bright and visually powerful architecture theme. Its mobile friendly and highly responsive WordPress theme. The theme designed for both kinds of users with or without coding experience. With this theme, presenting your engaging content is easier with the marvelous set of layout styles and navigation options. Since it gives unique looking gallery options, present your works right into a qualified and gifted website portfolio with your hands. The theme fully based on the Visual Composer and numerous customizable page templates with customizer support are also ready with the theme. So designing the site will not be a tough work for you. The designing team also made the theme has fully compatible with browsers and devices used all over the world. After all, the theme is fully compatible with the Slider Revolution, Layer Slider, and WooCommerce. Prague is a fresh and classic WordPress architecture theme. The theme most loved by the interior design service providers. Any field you work that’s not a problem, this theme added the designs and functions you need to achieve your goal. Prague has a number of menu forms and with fourteen selective demos for architectures. They offer various styles to create your site in a beautiful and charming look. Especially, impressive galleries present your products in marvelous styles. Plus, the Visual Composer page builder makes all designs changes come true with countless customizing options. Different slides exhibit your works and offer to the world in a visually enticing look. Sky Construction is solely created for the architects, building companies, independent builders, and engineering companies. Your site will seem wonderful on all devices and screen sizes. The designers created it as fully responsive, so it will suits on all kinds of devices in the world. It has two homepages, 9 gallery layouts, 4 cool blog designs, 12 menu designs, 20 pre-made color skins to build an incomparable site with zero problems. Furthermore, the theme comes with a powerful theme options panel, so that you can change the theme settings in some clicks. Besides, the theme tied a strong drag and drop page builder that facilitates you to build pages and organizing elements in your website easier than ever. This architecture theme also packed with Slider Revolution, this is an awesome slide displaying solution that allows you to display content with excellent transitions and animations. Lastly, this theme is fully SEO friendly and runs evenly across all main browsers. Aalto is one of the greatest themes uniquely designed for interior designers and architects. It gives many options to go online with an awesome and impressive style. Now you can have the complete handle of the website appearance with the demos and advanced features added on the theme. Few best things of the theme are 12 demos and tonnes of internal pages, extremely powerful shortcodes, and a powerful page builder. Just make one click, you can import demo content without any delay. Also, the theme is fully compatible with the WPML, Contact Form 7, and WooCommerce. Bauhaus is an amazingly talented and amazingly responsive architecture WordPress theme. This theme is a strong and adaptable key for webmasters at any knowledge level. With this theme, you can design a professional homepage and inner pages for presenting your projects and specialties by yourselves. As well, generating traffic through impressing and capturing the online audience attention also an easier thing. The users mostly love the theme’s editable layout design, via the individual visual composer page builder. This theme is also visually motivated, with the powerful visual customizer, Revolution Slider and live color changer. They make your layout and content talk with well-suited colors and animations. The Grafik WordPress theme is a fresh and fashionable theme designed by Select-Themes. It is fully built with the Visual Composer, which is the best page builder available in the market. The theme is ideal for exhibiting your ideas and influencing customers to utilize your services. This WordPress architect theme is completely responsive and works perfectly on various kinds of devices and screens. It also carries variant headers, video background sections and the facility to change your header in dark and light skins. As well, you can use the built-in slider and portfolio pages to visualize your greatest works for the users. Furthermore, it is fully fitted with all primary web browsers to hold all your website visitants. go.arch is an excellent WordPress theme for architects. It has two attractive layouts light and dark, they are the best answer to all your web design issues. Notwithstanding predesigned demos, the theme allows you to style and change the design as you want. Make anything you want with the go.arch. It will be a simple task forever. The features table of this theme has endless rows. Few of them are enticing shortcodes, remarkable portfolio and detail, highly attractive header, effective typography, and endless color combination. The architecture theme is completely responsive and cross-browser compatible, so the theme work fluently on all devices and screens. Monolit is a beautiful and artistic WordPress architecture theme. This theme is an excellent choice for designing unique modern websites. The theme needs zero coding knowledge to deliver professional quality results. Incredible animations and superb transitions are simple to use. With the theme, you can get access to wonderful premium Visual Composer page builder for achieving an awesome look for the pages. So creating an awesome website with a theme is fast and easy. Also, the theme incorporates tonnes of wonderful custom templates, you can use them with a single click on the demo import button. Monolit packs plenty portfolio designs suit to your every need. So attracting your viewers and improving your business will not be a hard work. StructurePress is a luxurious WordPress architecture theme. This theme is the perfect one for architects and construction companies who want to promote their works. You will receive a soft and stylish appearance perfect to add your ideas. The theme provides a fantastic home and portfolio layouts to show your works in superb look. It also gives a fabulous blog and services pages that pop out your best things when requested. You will get a good-looking contact page to connect with the clients. Also, StructurePress is fully responsive and translatable through WPML. Also, you can play with the design using the Visual Composer and WP Customizer. Brixey is a stylish and trendy WordPress theme. It’s well suited for architecture firms. This architecture theme is packed with wonderful plugins and 4+ demos with dark and light variations to work easily with the theme. This theme uses a mixture of Visual Composer and plenty of shortcodes to make website set up easier. As well, editing of the header, colors, and galleries is simply superb. Brixey is retina ready and marvelously responsive. There are also portfolios with stunning effects available to present your works. Besides, create awesome sliders to sell everything using the slider options. So everything wanted to change your business profitable, is at your hands. Get this wonderful theme. 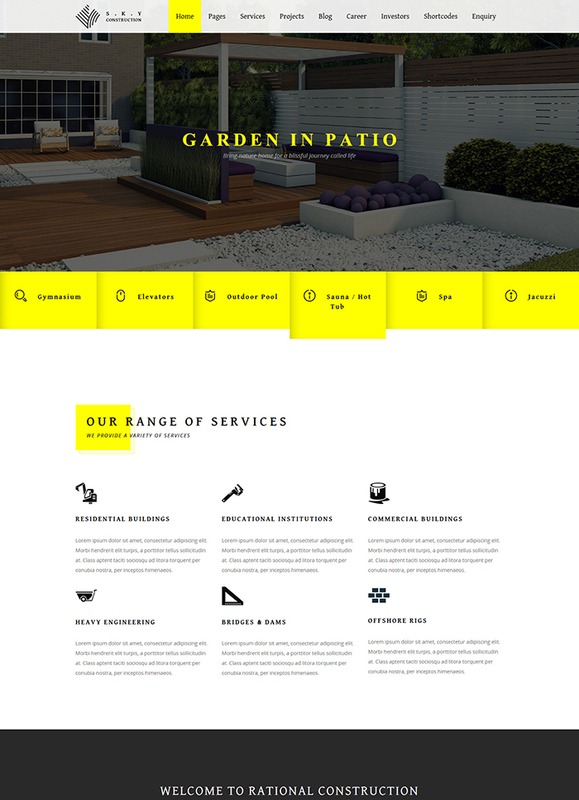 Ambient is a highly talented WordPress theme fit for any architecture services. It comes with 12 amazing niche homes and mind-blowing portfolio pages to make your work easy. They enable you to promote your services in an appealing and appreciating way. Add endless pictures and present them in a grid too. The theme has a delightful service page to present your services and pricing. This theme includes Visual Composer and a large set of shortcodes. You can also experience an outstanding icon font packs and widgets. Besides, it offers you a powerful admin panel, fast performance, marvelous headers, and great typography. Furthermore, you can see its mobile-optimized design than others. If you need direction, documentation is given. Ratio is an impressive and responsive WordPress architecture theme. It lets you create impressive architecture website without rewriting any code. The visual composer allows you to build modern and smart looking pages and sections. Showcase your content in a splendor looking sliders with wonderful animations. Also, this theme packed with professionally created 15 home pages, 6 + portfolio design templates, and awe-inspiring headers. The theme is not only for arresting the attention of clients. It also empowers you to sell any product you want directly from the website.